Honestly, microwave popcorn often smells like unwiped… well, it stinks when it’s cooking. This is especially true of the higher “butter” content microwave popcorn. But that’s okay–who am I to begrudge somebody a tasty afternoon snack? 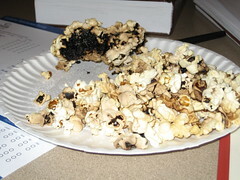 Burnt popcorn, on the other hand, smells like a grease fire in a smoker’s lounge, and tastes like flaked off iron from an iron skillet. (Don’t ask.) There’s no way you’re enjoying that popcorn, and you’re torturing the rest of us. More importantly, you seem to be burning popcorn with some consistency. Maybe you should try a sandwich for a snack instead: less office-consuming smell and probably fewer calories. Place in middle of microwave so that the “wings” of the turn up [as is marked on the package]. Listen for the popping to go crazy and then slow down to between and 1 and 2 seconds per pop. Steps 7 through 9 may be obvious to some, but I wanted to be clear, just in case there was any confusion.